Habit: Annual; proximal hairs powdery or scaly, generally +- white. Stem: generally 1; branches generally distal. Leaf: basal, withering or not, and generally cauline; largest blades +- deltate, not flat, (2)3--4-pinnately lobed, +- fleshy or not, nonglandular; 1° lobes generally 2--7(10) pairs, tips generally curved, +- cylindric. Inflorescence: heads discoid, 3--20+ per stem; involucre +- cylindric to obconic or hemispheric; longest phyllaries 7--10 mm, outer +- granular-glandular and shaggy-hairy, tip (all or inner) erect or curved inward, stiff, long-acuminate, needle-like, +- red; paleae (0)3--10+, like phyllaries, length > buds. Flower: corolla white to +- pink, 4--6 mm, outer radial, +- spreading, = inner. Fruit: 3--4.5 mm; inner fruit pappus generally of 4 scales in 1 series, longest 3--5 mm. Note: Often mistaken for Chaenactis stevioides but closer to Chaenactis artemisiifolia. Paleae unique in genus. Habit: Plant (5)10--30(40) cm. Leaf: basal +- withering, and cauline, longest 1--6(7) cm; petiole slender, flexible, base scarcely enlarged. Chromosomes: 2n=16. Citation for this treatment: James D. Morefield 2012, Chaenactis carphoclinia var. 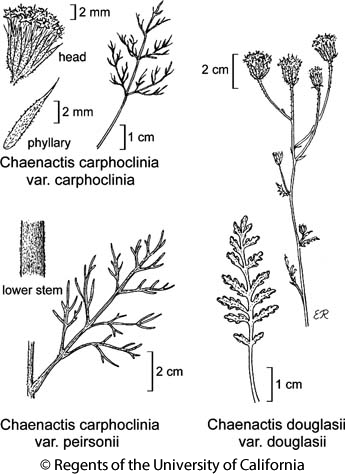 carphoclinia, in Jepson Flora Project (eds.) Jepson eFlora, http://ucjeps.berkeley.edu/eflora/eflora_display.php?tid=6935, accessed on April 24, 2019.
s SNE, D; Markers link to CCH specimen records. Yellow markers indicate records that may provide evidence for eFlora range revision or may have georeferencing or identification issues. Purple markers indicate specimens collected from a garden, greenhouse, or other non-wild location.